Posted on April 9, 2018 April 9, 2018 by Heather W.
Are you scratching your head trying to figure out why your beloved feline is no longer using their litter box? 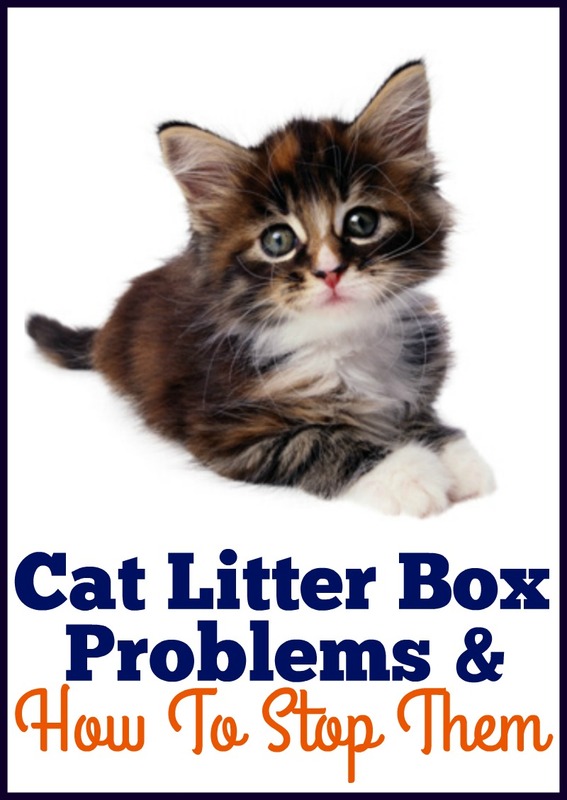 Here are some of the most common cat litter box problems and how to stop them! There is nothing more frustrating than when your cat suddenly decides they no longer want use the litter box. I had this problem several years ago when we adopted a new adult cat. The previous owner reassured me that she was litter box trained and I had never experience something like this with our other cat Tiger. Turns out that our cat Tiger was bullying the new cat, literally chasing the new cat away from the litter box if she attempted to use it… forcing her to go the bathroom wherever she could. Thankfully I witnessed this bullying so I was able to resolve the issue right away. From talking to various cat owners, discovering the solution is not always that simple. Here are some of the most common cat litter box problems and how to stop them. First and foremost, please find out if there is medical reason behind why your cat has stopped using the litter box . Your cat may have a medical condition that makes urinating too painful for them. You should always seek veterinary care if you believe your cat is suffering from a medical condition. Urinary tract infection (UTI) If you notice that your cat frequently enters their litter box but produces only a small amounts of urine, they may have a UTI. Feline interstitial cystitis Feline interstitial cystitis cause inflammation of the bladder. It can also cause a cat to eliminate outside the litter box because of the urgency to urinate. Bladder stones or blockage If your cat has bladder stones or a blockage, he may frequently enter her litter box. Your cat may also experience pain and cry when he tries to eliminate. Something else you need to narrow down is whether your cat is urinating inappropriately or actually marking… these are two very different behaviors! If your cat is urinating on vertical surfaces, then your cat is marking or “spraying.” If your cat is not spayed/neutered, having your cat fixed will almost always stop the behavior. Keep in mind that some spayed/neutered cats will mark urine to mark their territory or express they are stressed due to overcrowding, moving, changes in routine, new people and new pets in the home. You can help your cat cope with these stressful situations by providing them with a special place like cat trees and wall shelves. One thing many people may not consider is that their cat dislikes either the litter you are using, the litter box, or the location of their litter box. The most common form of aversion is when a cat avoids the box because of dirty litter. Cat’s have a very strong sense of smell (stronger than humans) so it’s very important to make sure you keep that litter box clean! Make sure that you scoop a minimum of once a day and completely change out the litter weekly. If your cat is still avoiding a clean litter box, then chances are your cat does not like the litter you are using. If you notice your cat isn’t covering his feces and is making very quick “litter breaks”… that’s a good sign he dislikes the litter. 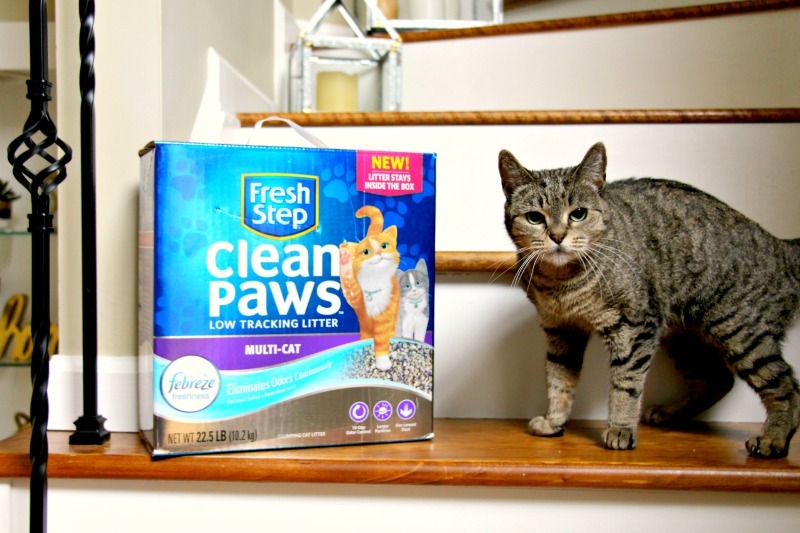 One brand that I have had great success with is the Fresh Step Clean Paws™ Multi-Cat Scented Litter with the power of Febreze™ because we have two cats. 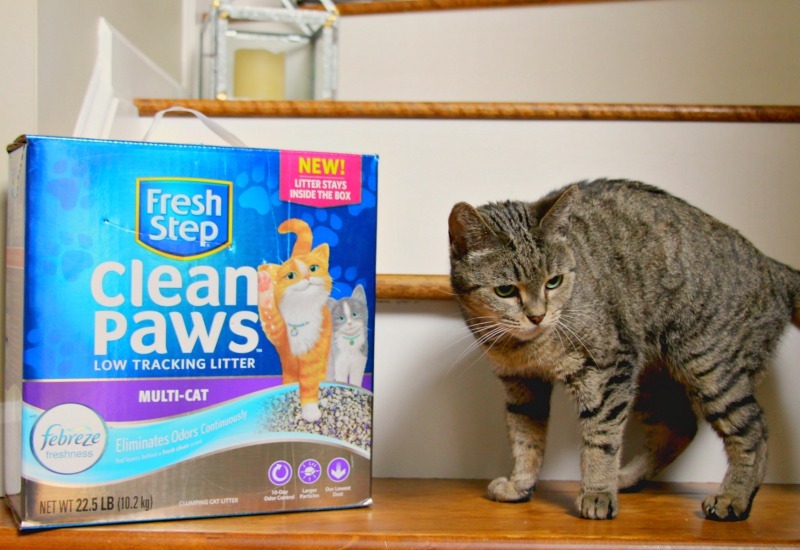 What’s great about this litter is that it contains 10-Day Odor Control (eliminates odors for ten days guaranteed) and has more odor-fighting power for pet owners with multiple cats. Awhile back I was getting very frustrated with the amount of litter I was having to clean up outside of the litter box. I tried everything to keep them from tracking the litter around the house and nothing seemed to work well. 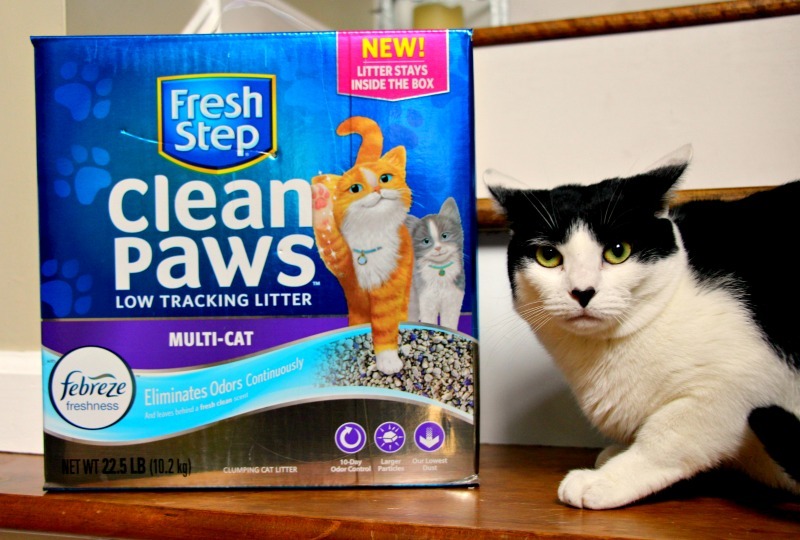 What is great about this litter is that it helps your cats to keep their paws and your home clean with the low dust and a special blend of larger particles is designed to stick less to your cat’s fur and stay in the box. This low dust formula is not going to help keep surfaces tidier, but it is also going to keep the air cleaner! 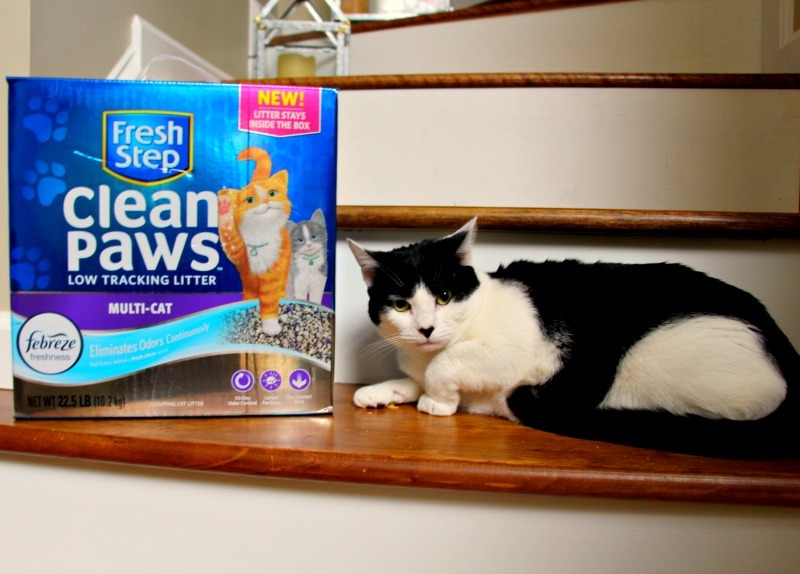 If you suspect your litter may be the reason your cat(s) are avoiding the litter box, I highly recommend that you try out the Fresh Step Clean Paws™. 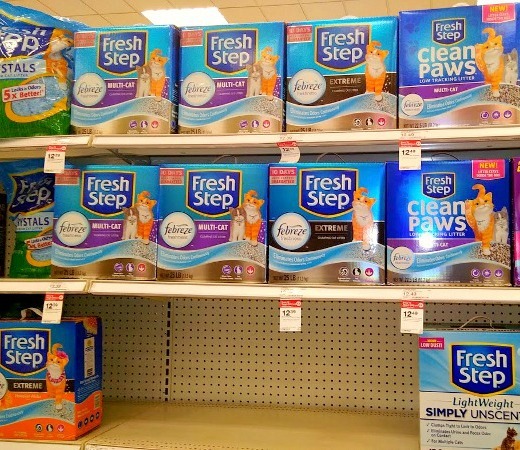 If you find yourself wandering into Target between 4/1-4/7, make sure to look for the Cartwheel offer on this cat litter! Please be patient with your cat while trying to discover their reasoning for not using the litter box! Never ever rub their noses in their feces or urine. Never scold your cat and/or drag them to the litter box. Do not punish your cat by confining them to a small room with the litter box. Cats are very smart and clean animals, they rarely ever go outside the litter box unless there is an underlying issue… so please be patient, loving and kind to your cat and help them to love their litter box again! Febreze and the Febreze Freshness logo are registered trademarks of The Procter & Gamble Company, Cincinnati, Ohio used under license by The Clorox Pet Products Company. © 2018 The Clorox Company. What a GORGEOUS cat! Our cats love Arm and Hammer – and we do too! Joely Smith recently posted…What I Am Wearing Today #16 Is This October? Very useful information mentioned in the blog. Can be used effectively. Using the litter box effectively is important. We should have the best litter box for our pets.